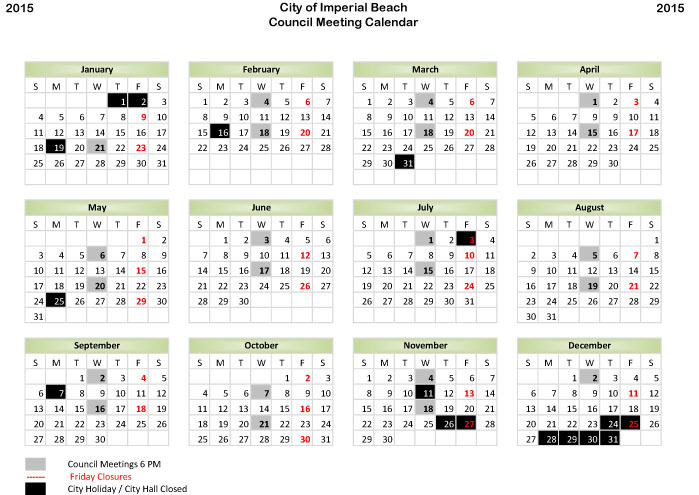 The Imperial Beach City Council has approved the schedule for council meetings for 2015, and the first meeting of the year is January 21 at 6 PM in the Council Chambers at 825 Imperial Beach Blvd., Imperial Beach, CA 91932. The Agendas for Imperial Beach City Council meetings are posted at the end of the week prior to the meeting date. Minutes are available after they have been approved by City Council. Check back often for updates! For more information regarding meetings, agendas, or minutes, please contact the City Clerk's Department at (619) 423-8301. All Agendas and Minutes are stored in PDF format. You will need to have Adobe Reader installed on your computer system in order to read or print the documents. If you do not have Adobe Reader, you may obtain it free by going to http://get.adobe.com/reader/.